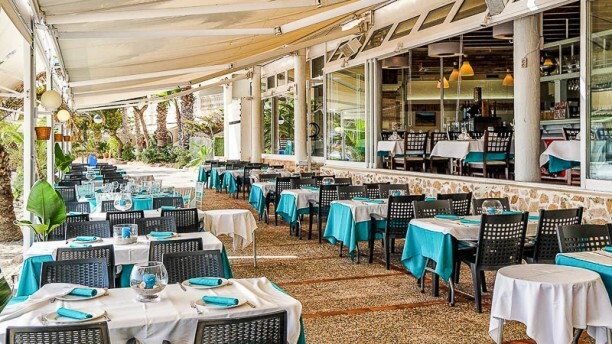 Nunca has contemplado una puesta de sol igual… Admira las mejores vistas a orillas del mar en Área Sunset, restaurante multifuncional que te conquistará por su emplazamiento exclusivo en La Manga del Mar Menor, ¡enfrente de la Isla del Barón! Además, su chef te ofrecerá la más deliciosa gastronomía mediterránea, paellas y carnes a la brasa. ¿Tienes un plan mejor? Vive un romántico atardecer en este restaurante de estilo moderno-rústico que dispone de dos salones interiores, una terraza a pie de costa y de un pub chill out, zonas idóneas para todo tipo de celebraciones, ¡desde fiestas de empresa hasta bodas en la playa! Elige qué vas a saborear durante tu visita al Mar Menor: chuletón de buey a la brasa, arroz meloso de gamba roja y salmón, goxua camarelizada… ¡Cualquier excusa culinaria es buena para disfrutar de la playa en Área Sunset! Servicio ininterrumpido de 11:30 a 23:00h (todos los días). Lovely location, good food and service, value for money. Would recommend. What a wonderful restaurant - staff were welcoming and nicely efficient; the food was superbly fresh and delicious. As vegetarians, they were happy to adapt recipes to suit us. The setting was perfect, right on Mar Menor, and the vibe inside the restaurant relaxed, inviting and friendly. And you can book online. Would go back and definitely recommend- thank you all at Area Sunset. Amazing setting on the beach of Mar Menor. Food was great ...very busy and staff were a bit frenzied. The salad was served with a large bug inside. The lobster was not cooked properly and the Tiramisu must have been taught in the grocery store, seemed fabric made. The food was overpriced. We were the only guests in the restaurant and was served by at least 4 different people. I would not recommend this place for eating to anyone. We were excited to be eating here after reading the reviews. However the food was quite simply dreadful We had prawn cakes and croquettes to start, avoid. Tagliatelle with garlic prawns was dry, crispy and clearly been under a hot light for a long time. Prawns were frozen and tiny. BBQ ribs and fries weren’t even average. This is a wedding destination and when you have 2 separate weddings at the same time then the food for regular bookings is going to suffer. We traveled a fair distance to eat here and we were in and out in 45 minutes. Lovely location, nice menu, and food was really good! Good food , nice location at the beach! Disappointed with the paella, flavourless and lots of little bones. All the dishes were very nice. We ordered: house of foie, that had pretty a lot of foie and was done in a right way, Cod fish with vegetables, that one was crazy nice and barbecue sirloin steak with patatoes, which was pretty nice but would like some souce. The service was nice, the place looks pretty good. Recommended to spend there 1 evening with sunset ???? We got there the place was completely empty and as nobody came to us I went to the counter. He asked me if I had a reservation and I said yes and offer to show him the email. He complaint that his boss didn't tell him anything. We both fell uncomfortable but I tried to make a joke about management in general. He let us choose the table and asked to see the email. Probably someone asked him to do so. I showed him and we made our order. The waiter was nice with us and could speak English that was great. But we could feel something wrong in the atsmosphere. We order the famous paella, that was ok but to be honest nothing so special as the reviews suggested. Maybe it was too early and that was just a bad timing. We were booked for 12:30 and we got there 10 minutes earlier. This is the second time we have been here. Location could not be better. Right on the beach overlooking the lagoon. Best plate of baby squid ever. Paella huge and great. Waiters are lovely and speak good english. We will be back. 150 euros for 4 people. 3 courses and drinks.